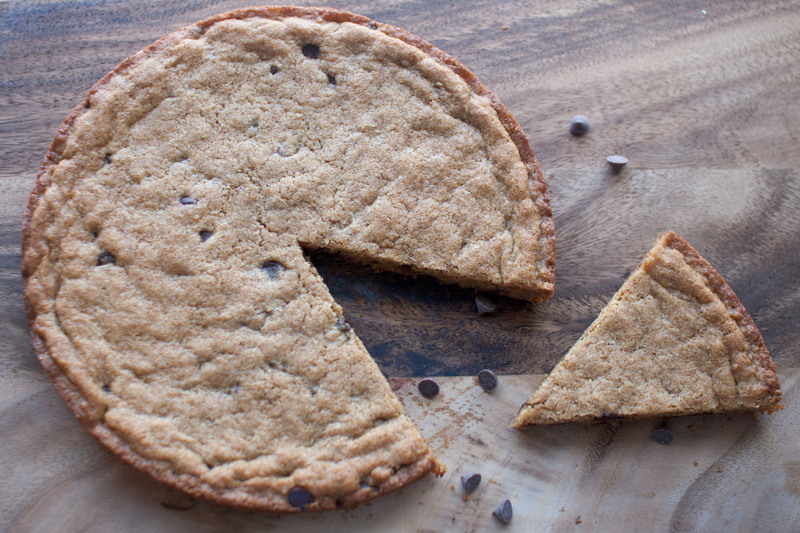 The only thing better than a cookie is a BIG cookie, and this chocolate chip cookie cake is just that — a big cookie. I originally baked this cookie cake back in April for my husband, an accountant, to bring into his work as an end of tax season celebratory treat. I ended up making it that morning and didn’t leave time to photograph it (or even taste it for that matter), hence the reason why it has never made an appearance on my blog. But the other other day when I was going through my bookmarked recipes, I was reminded of this cookie cake and decided to make it again to share with all of you. I hope you like it as much as I do. Preheat the oven to 350 degrees. Lightly butter a springform pan. In a large bowl, cream the butter and brown sugar together with an electric mixer until fluffy. Add the vanilla and almond extracts and the egg, blending until well mixed. Slowly add the flour mixture until everything is well incorporated. Using a spatula, fold in the chocolate chips. Put batter in your prepared springform pan and use a spatula or your fingers to press the dough into the bottom of the pan until it covers the bottom. Bake for 20 to 25 minutes or until the cookie is lightly browned throughout. Remove from the oven and cool the cookie in the pan on a wire rack. 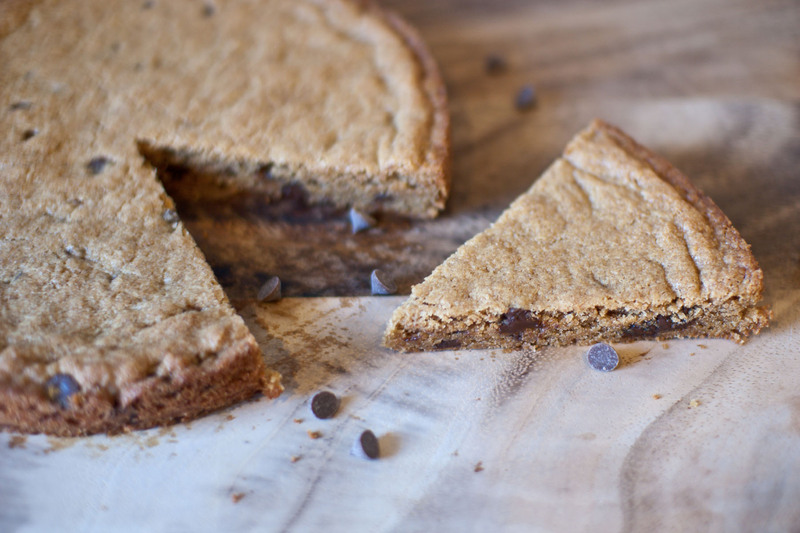 Once cool, remove the cookie from the pan, cut into slices and serve. What a great idea! My kids love cookie cakes! It’s such a nice change from the ordinary cakes! I made a cookie cake like this once and it never even left the pan, we just ate straight from it, it was so good. I’ve got to make this. This reminds me of a place Shaun and I used to go often when we first started dating. For dessert we’d always get a deep dish cooke with vanilla ice cream, mmm.. I love how you’ve used almond extract, too. Trying this recipe ASAP! looks delicious.